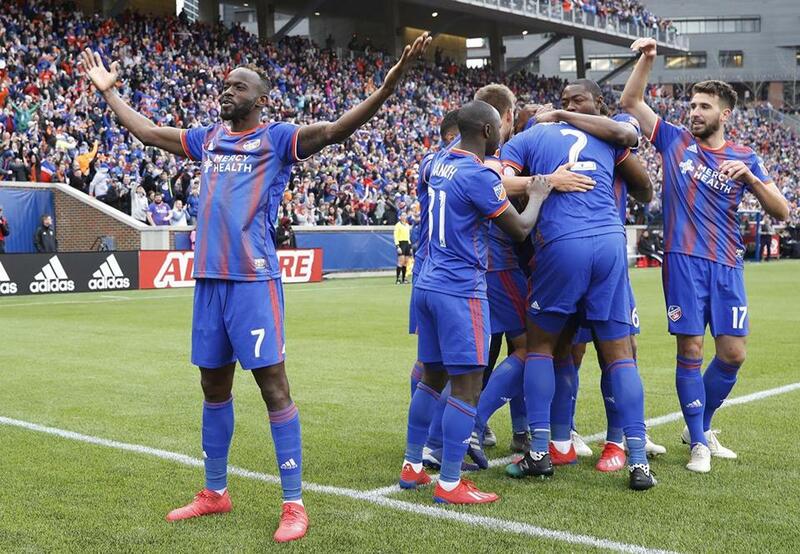 FC Cincinnati is off to a 1-1-1 start in its inaugural MLS season. The Revolution play five of their next six games at home, a perfect opportunity to turn their early-season struggles into a successful run. That string of matches begins against an undermanned FC Cincinnati Sunday afternoon. Fresh off its first-ever MLS victory, the expansion Cincinnati team is missing five players to international duty and another three to injury. It will be an early test of depth for them, while the Revolution (0-2-1) have a golden chance at a first victory. Cincinnati (1-1-1) leads the league in offside calls with 14 already through three games. New England’s pressing system and high backline create a perfect storm to increase that total, though it’s a risk-reward defensive method. With Cincinnati likely to feature various reserve options, the Revolution could exploit their opponent’s overaggressive attacking style by playing the offside trap. While Cincinnati excels at defending balls in the air, it has struggled at limiting chances created along the ground. All five goals it has allowed have come this way, created by low crosses or sharply hit through balls along the ground. Revolution midfielder Carles Gil will be a particularly important piece in setting up the attack. His creativity and clinical prowess have been on display already, as he has scored all three of New England’s goals. But Gil must be even more impactful against a team missing two of its top defenders. The Revolution set a franchise mark for home wins during the 2017 campaign but posted a disappointing 8-4-5 record at Gillette Stadium last year and lost their home opener to start this year. With this run of Foxborough games through April, they need to feed off the home-field advantage and maximize points. Cincinnati has shown it can be skittish on the road, despite tying, 1-1, at Atlanta two weeks ago. For the Revolution to succeed, they must make Cincinnati uncomfortable in the early minutes, especially on a fast turf surface. ■ When, where: Sunday, 4 p.m., at Gillette Stadium. ■ Coaches: Revolution — Brad Friedel; Cincinnati — Alan Koch. ■ Formations: Revolution — 4-4-2; Cincinnati — 4-2-2-2. ■ Goalkeepers: Revolution — Brad Knighton; Cincinnati — Spencer Richey. ■ Out: Revolution — M Isaac Angking (knee), D Gabriel Somi (international duty), M Zachary Herivaux (international duty), F Justin Rennicks (international duty); Cincinnati — M Jimmy McLaughlin (knee), D Kendall Waston (international duty), D Alvas Powell (international duty), M Allan Cruz (international duty), M Frankie Amaya (international duty), F Darren Mattocks (international duty). ■ Miscellany: This is the first-ever meeting between the Revolution and expansion Cincinnati . . . Since 2015, the Revolution are 4-2-3 against first-year expansion clubs, most recently tying Los Angeles FC last season . . . Cincinnati leads the league in offside calls with 14 through three games . . . When Cincinnati beat Portland, 3-0, March 17, it tied the MLS record for largest margin of victory by an expansion team in its home opener.